getting warmer... its called Flirting with the Bosch. In the Bow Valley but on Mt Borgeau. There's a classic 200m WI5 ice climb (Borgeau Left) just out of sight behind - you can see the remnants of snow/ice at the bottom of the pic. micro TR... I walk up the hill after work. 30mins walk to the cliff from my office, then 100m of bolted limestone (4 sport pitches). 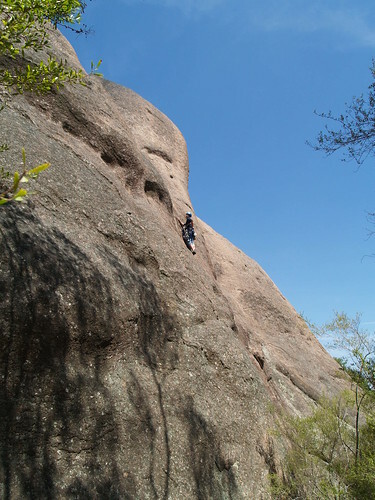 There are 6 or 7 other rock routes either side of it. Nothing to fly across the world for, but its fun when its right outside the door. The rock is good quality prickly limestone, just under vertical. Pretty typical for the area - better rock than Yam (Yam is overhyped choss). Right then, I'm gonna have a go. Nope. It's in Eastern Australia. tarana - up the nose of love? >tarana - up the nose of love? Your past the crux (kinda) so ya get it clean ?..Ill let someone else guess as I got no piccys. Steve Crimpshaw's ridiculously reachy 23 variant at Faraway Wall who's name I forget? [EDIT] Rod / Vanessa's original is a very pleasant 19 if you aid the one hard crank off the crimp (which is easily visible in the above photo as the well chalked horizontal in the middle of the blankness right of the climber). At least my crux is doable by short and tall persons. But as I've just read Lyn Hills biography I really shouldnt be complaining about height. I just have to learn to jump and do Houdini moves. >At least my crux is doable by short and tall persons. >about height. I just have to learn to jump and do Houdini moves. Are we talking Low Mountain, Yangshuo or somewhere close by? I think the Mad Taff is giving a big clue and the climb is The Monkey King, maybe pitch3 ? Wow Vanessa! You're even hotter than I'd imagined!